‘Little does contemporary religion ask of man. It is ready to offer comfort; it has no courage to challenge. It is ready to offer edification; it has no courage to break the idols, to shatter callousness. The trouble is that religion has become “religion” – institution, dogma, ritual. It is no longer an event. Its acceptance involves neither risk nor strain. Religion has achieved respectability by the grace of society, and its representatives publish as a frontispiece the nihil obstat signed by social scientists. We define self-reliance and call it faith, shrewdness and call it wisdom, anthropology and call it ethics, literature and call it Bible, inner security and call it religion, conscience and call it God. However, nothing counterfeit can endure forever. It is customary to blame secular science and antireligious philosophy for the eclipse of religion in modern society. It would be more honest to blame religion for its own defeats. Religion declined not because it was refuted, but because it became irrelevant, dull, oppressive, insipid. When faith is completely replaced by creed, worship by discipline, love by habit; when the crisis of today is ignored because of the splendor of the past; when faith becomes an heirloom rather than a living fountain; when religion speaks only in the name of authority rather than with the voice of compassion, its message becomes meaningless’. 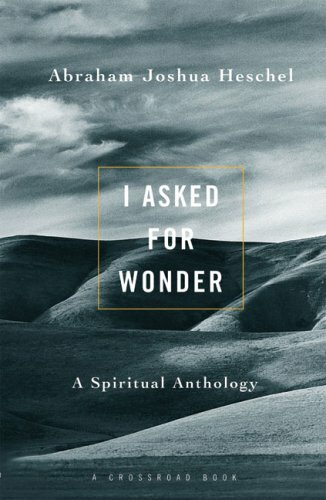 – Abraham Joshua Heschel, I Asked for Wonder: a spiritual anthology (ed. Samuel H. Dresner; New York: Crossroad, 1988), 39–40. Indeed Heschel with Buber have both helped Christian theology. Especially Buber towards some of Brunner’s works and books. What is this religion that is no longer religion but is now ‘religion’? I find it fascinating that Heschel sounds so Barthian in his talk of “event.” Given that they were contemporaries, I’d love to know how the broader historical and cultural context they both lived in led them to have this similar approach to religion, despite the religious divide. I am challanged by this quote from Hescel’s book Jason. However I find myself wondering does he ever come to the point of moving from critiquing contemporary religion to what shane clairbourne put as dreaming and working towards what church could be? @ Howard: I’m not sure that Heschel, as a Jewish theologian/philosopher, was too given to worrying about what the church should be. I am interested, though, to hear about what in the quote challenged you. Love Heschel, thanks for an absolute gem of a quote. Most helpful to the Church because he’s not speaking (necessarily) to the Church of truths which it needs to hear. Particularly, I’m challenged by the truth that there is a waxing and waning within myself of religion and ‘religion’, and the “dreaming and working” is found in identifying and correcting those places where I have embraced the “irrelevant, dull, oppressive, [and] insipid”. And I think that last paragraph gives very clear and helpful direction for what kind of ‘event’ Church should be.